Electric wire and Cable manufacturers, of 296/302 High Holborn, London, WC1. 1919 Enfield Ediswan Cable Works Ltd was incorporated to take over the business. Incorporated as a public company. Edison Swan Electric Co bought shares in the company and Ediswan was included in the name of the company. 1923 Issue of preference shares to fund expansion and construction of a rolling mill for rolling copper rod and strip. Edison Swan sold its shares and the name Ediswan was removed from the company's title. 1933 Patent - Improvements in electric cables. 1933 Patent - Improvements in flexible electric cables. 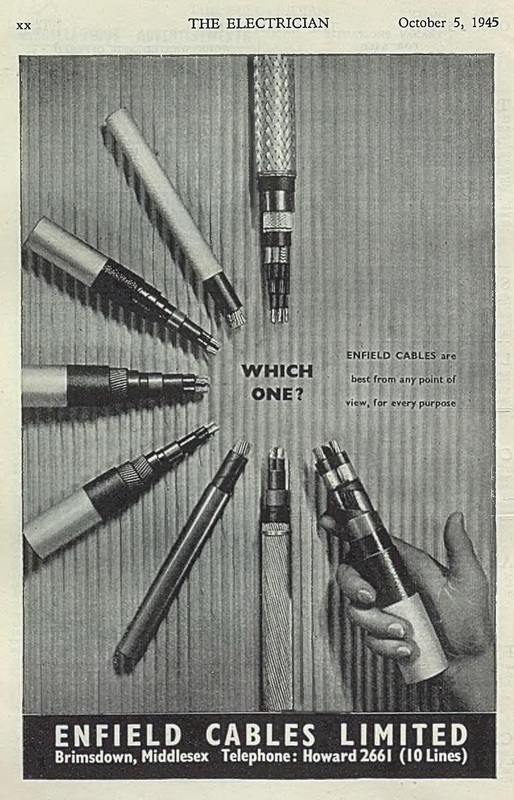 From 1959 to 1964 joint owner with Standard Telephones and Cables of Enfield-Standard Power Cables Ltd. This page was last edited on 24 December 2017, at 19:48.